JUNE 16, this Sunday, is FATHER'S DAY! We have great selection of watches sure to make any dad happy! JUNE 26, Our Downtown Store RE-OPENS at 623 N. Milwaukee Street, in the new Marriott Hotel! Make sure you stop in and see our new digs -- it's beautiful! JULY 22, is the Pre-Qualify Regional Round at Shoreacres Golf Course in Lake Bluff, Illinois. Interested in golfing with Ernie Els and his PGA friends this October, stop in our Whitefish Bay Store and buy one of the two Limited Edition Els for Autism Breitling Chronographs. To learn more about the Els for Autism Breitling Chronograph, click here. BREITLING HAS TEAMED UP WITH ELS FOR AUTISM by creating a Limited Edition, with the proceeds from this sale going to help children with Autism, as well as enter you to participate on the Schwanke-Kasten Golf Team at the July 22 Pre-Qualifying Round in Lake Bluff, Illinois. To advance to the Grand Finale Round where you play golf with Ernie Els and his PGA Friends, your team must either win the Pre-Qualifying Tournament or raise $13,000 for Els for Autism. To learn more about Els for Autism, click here; To learn more about Els for Autism Golf Challenge, click here. JULY 29 - AUGUST 4 -- The Breitling Jetman will be at EAA -- details next month! 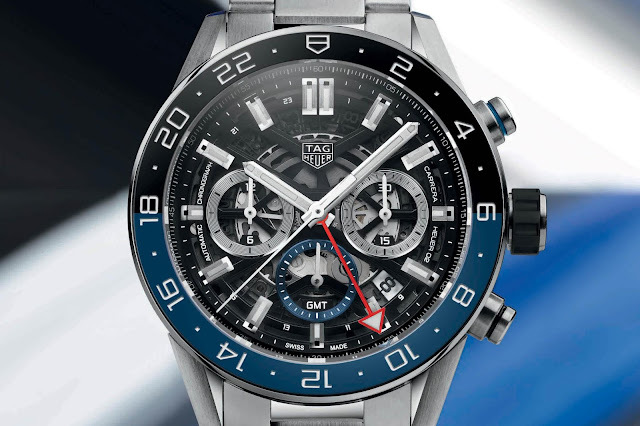 This year at Baselworld, it was the year of the GMT, stemming mostly from announcements from Rolex, Tudor and TAG Heuer. However, you may not know exactly what this function is for or even how to set it! A GMT, or Greenwich Mean Time, function allows the wearer to read a second time zone. Historically, GMT was used as the international civil time standard at the Royal Observatory (in Greenwich, London). As Great Britain grew into a maritime empire, sailors kept at least one chronometer aboard to measure the distance from their perceived longitudinal Greenwich Meridian which help keep track of how far or behind time they were based on a lunar calendar. The GMT then was adopted by the Railway Clearing House to sync train times. Despite being replaced by UTC (Universal Time Coordinated) time as early as the 1950’s, the GMT name stuck. Sort of like NATO straps. Although the Georges Kern led-Breitling, unveiled their newly revamped strategy for the iconic watch manufacturer in February, the world got a taste of additional releases and strategies at Baselworld 2018! Tom Dixon at Schwanke-Kasten Jewelers got the inside scoop. Until recently, Breitling was synonymous to solely aviation and exceptionally large, flashy watches, with an occasional venture into motorsports and diving (Bentley Partnership and Superocean Range). Now, Breitling will be focusing on a three-tier approach: Air, Land and Sea, announcing various partnership with celebrities and organizations over the week. A common theme we’ve noticed is a return to the pragmatic “instruments for professionals” approach that caught the hearts of many watch enthusiasts as well as a downsizing of watch size and SKUs available. More importantly, no more “Betty on the Bomb”. With the release of heavily promoted “Kingsman: The Golden Circle” by TAG Heuer occuring several month ago and the Academy Awards on Sunday, we decided to explore the "link" between TAG Heuer and film and TV. TAG Heuer is no stranger to the silver screen, with cameos beginning in the 1970’s. 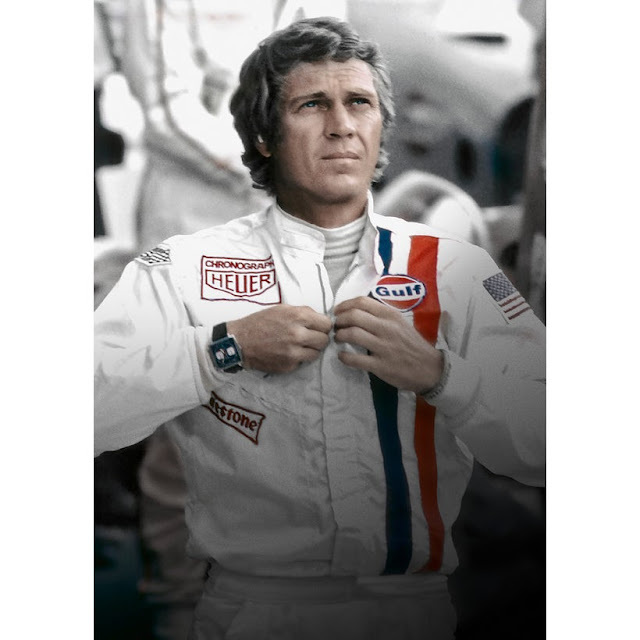 Le Mans (1971) Speaking of 1970’s, the Steve McQueen 1971 cult film Le Mans has been arguably one of the most influential movies for the TAG Heuer Monaco, which was released just two years prior. Le Mans, which was largely considered a box office flop, portrayed the excruciating race, The 24-Hours of Le Mans, a legendary endurance race in Northern France. The protagonist, aka “The King of Cool”, sported a TAG Heuer Monaco with capitulated the watch from relative obscurity to the main light! In 1969, TAG Heuer created the Monaco, in honor of the Formula One Monaco Grand Prix. The Monaco became the first chronograph in a square case and has changed very little since its inception.